Facebook has reinstated a group against the LGBT event Pink Dot in Singapore, after temporarily shutting it down. Called “We are against Pinkdot in Singapore”, the group first came to attention for flagging an escalator ad found in Cathay Cineleisure which promoted the annual Pink Dot event. 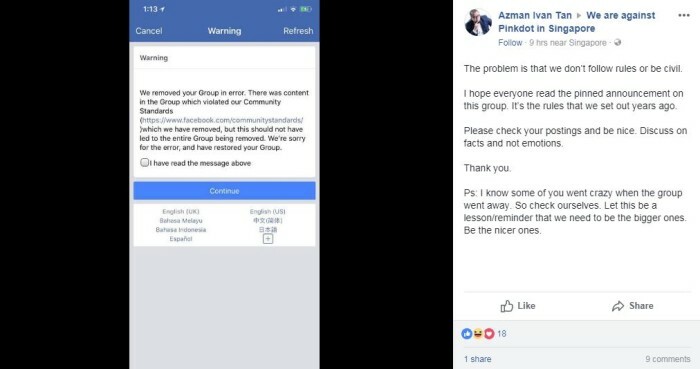 According to screenshots making its rounds online, “We are against Pink Dot in Singapore” was initially taken down by Facebook for displaying hate speech. Since the group’s reinstatement, an administrator of the anti-Pink Dot group has shared a screenshot from Facebook that it had removed the group “in error” as there was content in the group which violated Community Standards. The message added that this “should not have led to the entire Group being removed”. Read his full post here. The administrator has also reiterated the importance of the rules that the group had “set out years ago” about the nature of their posts. He called for all members of the group to check their postings, be nice and discuss on facts, not emotions. Rules of engagement of the group were also pinned on the top of the page since the matter unfolded. “I know some of you went crazy when the group went away. So check ourselves. Let this be a lesson/reminder that we need to be the bigger ones. Be the nicer ones,” the administrator added. 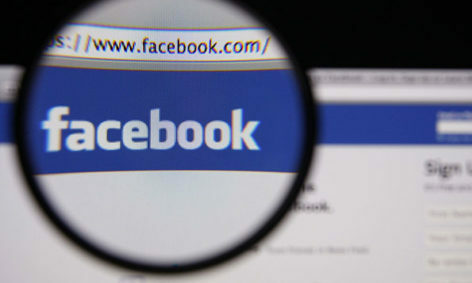 In a statement to Marketing, a Facebook spokesperson confirmed that the group was removed in error. “There was content in the Group which violated our policies, which we have removed, but we should not have removed the Group in its entirety. We’ve restored the Group and are sorry for the error,” the spokesperson added. Last year, “We are against Pinkdot in Singapore” came to public attention for criticising both Pink Dot organisers and Cathay for displaying the ad, with members of the group also claiming they had made police reports. The matter later escalated into an exchange between the Advertising Standards Authority of Singapore (ASAS), Cathay and Pink Dot organisers over the copy found in the ad, with ASAS requesting for the event’s tagline to be amended. ASAS’ resquest sparked backlash, prompting them to release a statement clarifying that ASAS’ process of deciding on whether or not an ad is suitable for display is not a one-man decision. The statement was signed off by then-ASAS chairman, Tan Sze Wee. Social talk: What were Malaysians most concerned about during #GE14? By scanning limited edition packs of VLT, users can uncover different performances from their favourite musicians, from solo rendi..
Mediacorp's Miguel Bernas discusses what brands need to think about before engaging influencers. .. In a conversation with A+M, Loo said the entire process in not a rebrand but rather a launch of a while new brand. ..
Is advertising on a suicide mission to wipe itself out? lead the pack and stay current. ©2019 Marketing-Interactive.com. Lighthouse Independent Media Pte Ltd.